Producing a show in a new city is always stressful. You have no track record of good shows, your email address is unfamiliar to journalists, and just who do you think you are coming all the way from Vancouver putting on a show in Hogtown? I was nervous and starting to feel sad that no one was paying attention. Sure, my show made it into BlogTO, The Grid, and Now listings, but I hadn’t been contacted by anyone for any sort of preview about the show. I’ve been spoiled in the past. Last time I did a show in Toronto was for the 2007 Fringe when I did F*ck Off and Die: Tales in Teen Angst Poetry and I got all sorts of great pre-press. 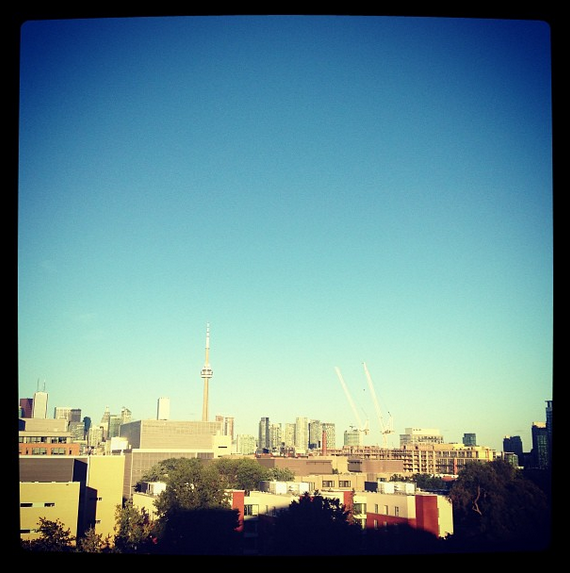 It was silly of me to produce a show during the Toronto International Film Festival. Wah. Wah. Wah. Then Friday morning I woke up to a bunch of text messages and tweets from friends and followers telling me that CBC Metro in the Morning was talking about Say Wha?! 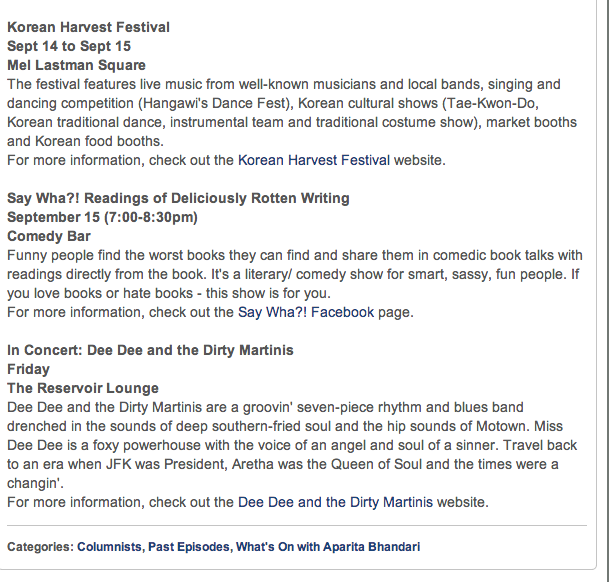 and how it was one of their recommendations for things to do this weekend. Here’s a screen grab from their post. Then to make my Saturday sparkle my best friend texted me this photo. 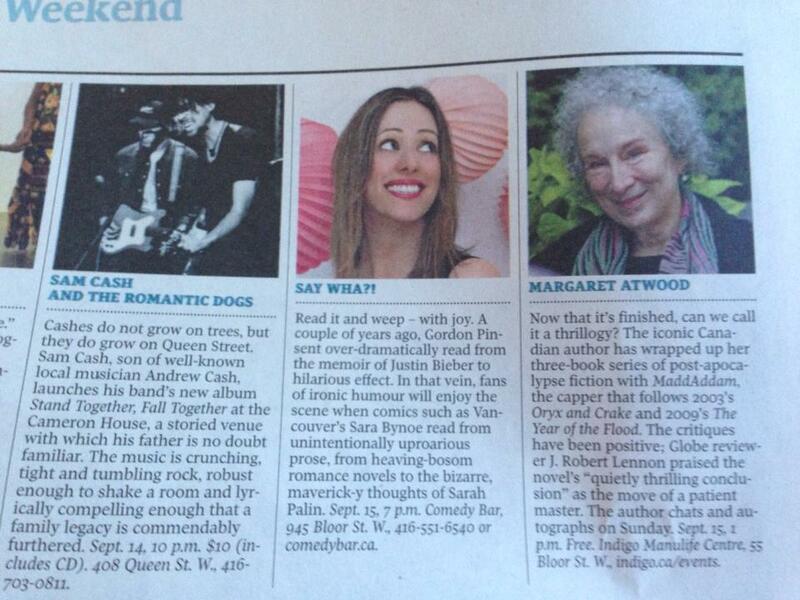 The Globe and Mail included my show as one of five things they think you should do in Toronto this weekend. I’m cheekily gazing over to the Queen of literary Canada, as if to say, one of your books is next. I know it’s terrible to equate self-worth with media recognition, but it makes me feel respected and a part of the creative community when the crazy shows I produce get covered in the media. I’m really looking forward to tonight! If you didn’t buy your ticket in advance I suggest you come to the box office early, it opens at 6pm, doors are around 6:30 and the show is at 7pm, Comedy Bar, 945 Bloor Street.